beWISE provides a very easy-to-use interface for sharing data between your applications, allowing them to exchange information in real-time. Simply share variables among all your VB.NET, VB6 and C programs as if they where global variables of a single program. With beWISE you can make your VB.NET, VB6 and C programs work together like a team. Your VB6 application could e.g. get information from your C driver, process it and deliver it to your VB.NET program for displaying. The VB.NET user interface could in turn remote control your driver and the VB6 application. All by just changing values of shared variables; no knowledge of Inter-Process Communications (IPC) required. Add the beWISE DLL to your application, declare your variables and you are ready to go. 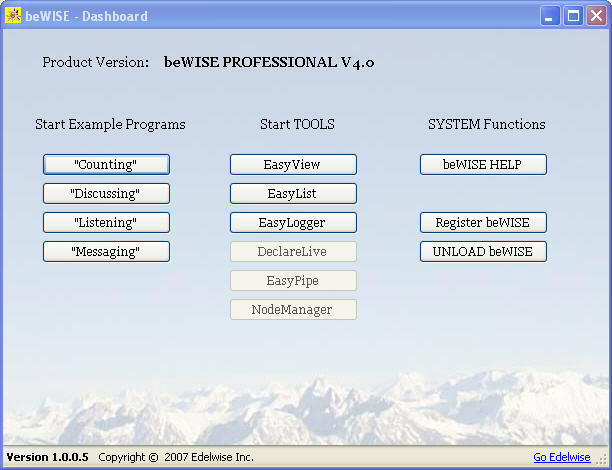 The beWISE product is good for parallel software development, integration of legacy applications and creation of distributed systems. Bit Manipulation Functions for Visual Basic. Access locked or unviewable VBA Projects. Recover and preview VBA source code. .NET 2.0-4.5 components, for fast, easy video capture, playback and processing. .NET 2.0-4.5 Advanced Computer Vision Library. Motion, and Image recognition. Set of .NET 2.0-4.5 components for fast, easy video capture and playback.